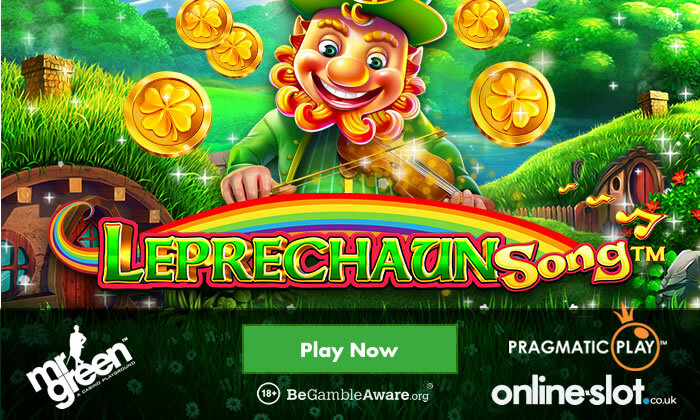 Slots players can try and summon up the luck of the Irish in Pragmatic Play’s new Leprechaun Song which is available to play at Mr Green Casino. It’s a 5 reel, 20 payline game that’s packed full of colourful cartoon design – as usual from Pragmatic Play, it looks superb. As well as the Celtic style playing card values, you’ll see pints of Guinness, pipes (of the smoking, rather than plumber’s variety) and a green top hat. Best of all is the grinning leprechaun who offers of up to 20 times your stake per payline. Helping your winning chances is the rainbow wild which pays up to 40 times your stake per payline. Pragmatic Play has delivered a good range of extras here, starting with a trio of modifiers that can land any spin. You could end up with a random selection of extra wilds, a pick me bonus or a spin with a colossal 3×3 symbol. Landing 3 pot of gold scatters triggers the main bonus features. You have the Bonus Game feature where you’ll get 10 free spins with a 2x multiplier. Before the round starts, pick from the field of mushrooms to add extra free spins to your total as well as multipliers and added wilds. In the Coin Collector feature, 15 free spins are on offer with a 2x multiplier. Every time a coin symbol lands, it fills a meter. Collect 5 and the multiplier increases by 1 and 5 extra free spins are added to your tally. Get all the way here and you could end up with plenty of extra free spins and 6x multipliers. You could also trigger a Giant Symbols feature where you’ll receive 3 free spins with a colossal 3×3 symbol landing on each of them. The Irish fortune themed slot is as old as the hills. This is a pretty good example of the ever-popular genre. The design is nicely done and there’s a solid range of extras. If you like your slots celebrating the Emerald Isle, then Leprechaun Song is worth a look. Take Leprechaun Song for a spin at Mr Green Casino. New players are eligible for an exclusive 20 no deposit Starburst free spins, a 100% bonus of up to £100 as well as 200 more free spins.